Policy that addresses conflict between wildlife and Bhutanese farmers is explored in this chapter. The policy strives to promote rural livelihoods and reduce animal attacks on crops and livestock without compromising Bhutan’s conservation record. No single actor dominates the process of policy implementation as it is uneven across geographic areas and different groupings of governance actors. 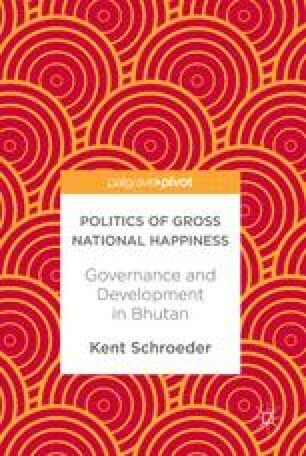 The Gross National Happiness (GNH) policy tools are rarely used and Bhutan’s decentralized framework has contributed to confusing lines of reporting, communication, and accountability. The result is emerging ambiguity around the cause of human-wildlife conflict and evidence of a budding conflict between cultural values at the foundation of GNH. Department of Agriculture. (2014). Agricultural statistics. Department of Agriculture. http://rcbajo.gov.bt/wp-content/uploads/2016/04/Agriculture-Statistics-2014.pdf. Accessed Apr 16 2017. Tobgay, T. (2016). The state of the nation: Office of the Prime Minister and Cabinet. http://www.cabinet.gov.bt. Accessed Apr 16 2017.